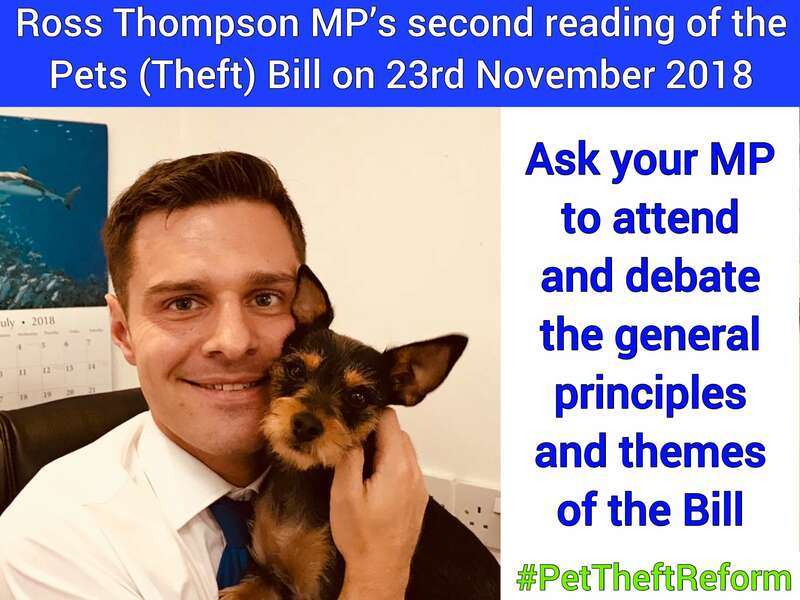 Change of date for Ross Thompson MP’s Private Members Pets (Theft) Bill to 25 January 2019 #PetTheftReform. Write to your MP. If you haven’t already please take five minutes to email or write to your MP and ask them to attend and debate the general principles and themes of the Bill. A change in the law is necessary to deliver justice for victims of pet theft, and to give more peace of mind to the 12 million UK households with a pet. This Bill will create a new, separate criminal offence in its own right of pet theft, recognising the self-evident fact that the theft of a living, sentient being is in a whole different category to the theft of an inanimate object. We are talking about the abduction of an animal, of what most pet owners would consider a central part of their family. It’s a crime that’s either more thoughtless or more malicious – or both – than the theft of an inanimate possession. And the Bill will also require that sentencing is appropriate to the level of emotional harm caused by the theft, recognising that, for victims of pet theft, it’s the emotional loss, not the financial loss, that really matters. After all, today a growing number of companies offer bereavement leave for employees who’ve lost a pet. If we can give due recognition to the emotional effects of the loss of a pet in other walks of life, why can’t we do a better job of it in the courts? My intention is that this Bill effect these necessary changes across Great Britain – in England and Wales, yes, but also in Scotland. Don’t forget to add your own address and postcode to verify you are their constituent.